On Saturday a small book was released nation wide that made a big claim, Canadian housing prices are poised to drop between 40% to 50%. 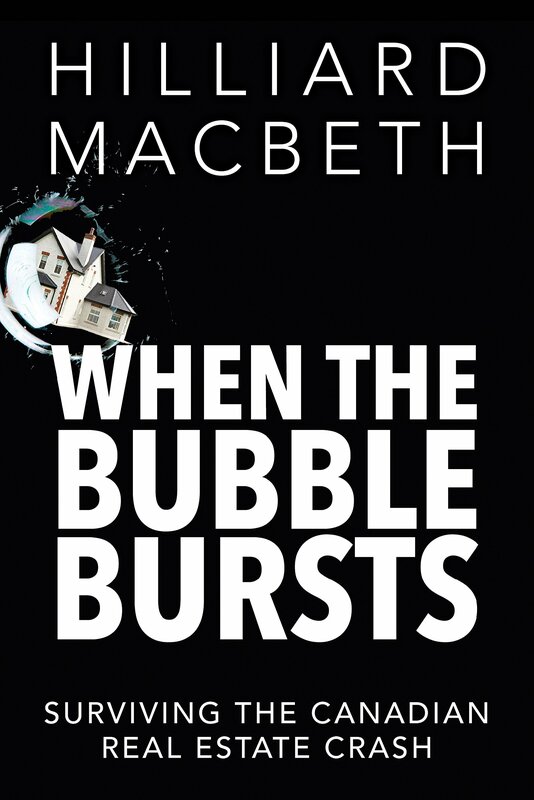 Written by a financial advisor in Edmonton, Hilliard MacBeth, When the Bubble Bursts is a grim and insightful polemic about both our obsession with housing and the danger such high valuations pose to our economy. I’ve been negative about Canada for a long time, particularly about Canada’s improbable and endless real estate boom, but what the author has done in his book is attach some actual numbers around how serious our housing problem is. I picked the book up on Saturday and it is terrifying. His insights are troubling and his points are all backed with reputable sources. Like all serious financial problems it is the interconnectedness of the our financial lives that magnifies the impact of any bubble. Hilliard’s chief accomplishment is to show just how interconnected these issues are. The real estate bubble eats into the middle class need of disposable income, encourages people to view their home as the primary source of savings while banks profit off the increasingly indebted backs of hard working Canadians. Government insurance on mortgages (which protects banks, not you) also ties the public coffers to the inevitable need of bank bailouts, while governments themselves worsen the situation by helping boost the homeowners’ market. In Hilliard’s view we have sold ourselves on a dream, that our homes can increase in value forever (above the non-existent rate of inflation), that we can use our home equity lines of credit to fuel our lifestyles and that as Canadians we are somehow immune from the normal problems that affect other economies. We aren’t and we aren’t ready for the financial collapse that is coming. I’m sympathetic to this view. But since I live in Toronto, and our author lives in Edmonton I think it is important to note some financial nuances that should be considered. For instance, not every market is built equally. Bubbles are as much a product of oversupply as they are speculation (which fuels the supply). But in the last 30 years we have become an increasingly urban society. When it comes to value in homes it is frequently the land that we find valuable, not the building (the building is a depreciating asset, like your car). Desirable land is in short supply, and that explains why our urban world is more often than not a suburban world. Look at this expected growth in population around the GTA from now until 2031. Notice that there isn’t expected to be substantial growth within the core city of Toronto. But as we look to the suburbs, where land is cheaper and desirability for homes will be lower but more affordable we find our source for significant speculation. In short the insurance against significant losses on your home has everything to do with desirability of the land. This held true particularly in the United States in their own housing bubble. Cities like Phoenix and their accompanying suburbs proved to be the most susceptible to the market downturn. New York on the other hand was far less severely impacted, and I would imagine even less so if we had numbers for Manhattan. 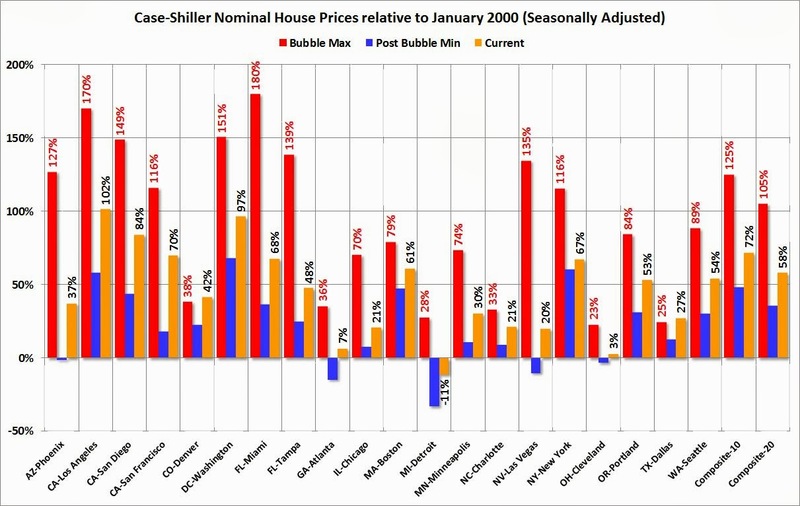 The above chart shows three numbers regarding several American cities using the year 2000 as a baseline; from the peak of the housing market, the lowest point in that market, and where they stood five years later (2013). In Phoenix, house prices had jumped 127% from where they had been in 2000. They then dropped back to their 2000 values in the correction, and had recovered by 37% by 2013. In New York however, prices had risen 116% from their values in 2000, but only lost 40% of those gains in 2008 and were valued at 67% above their 2000 price five years after the correction. Dallas and Denver were both above their bubble highs by 2013, while Los Vegas was still off 110% of their previous market high. This should seem obvious. The old line on real estate is “location, location, location”, and it is location that locks in value. There is no hidden land to be developed in Leaside, no undiscovered country in Rosedale or Lawrence Park. On the other hand Vaughan, Pickering, Ajax and Mississauga are all areas to be concerned about, both because they attract younger buyers with lower savings and it is where we see the most growth in new homes. It’s logical to assume that the worst impacts of a correction will be felt there. But the truth is, when the Canadian housing market corrects it will cause us all a problem. It will magnify the effects of a recession, put pressure on the federal budget and worsen our prospects internationally for investment. That some neighborhoods will be less affected than others is of small consequence. It will affect those with no savings far worse, disproportionately affect the younger (and more financially vulnerable) while hitting those baby boomers depending on their home sale for retirement very hard. Since no one knows when this will happen the best thing for prospective home owners to do is have a conversation about the choices they are making now, to save more, reduce debt and rethink whether big home purchases or significant renovations are the best use of our money. Corrections are inevitable. Bubbles burst. Whether we are prepared or not can determine your financial future.